A Bio-disinfectant for air and surfaces. Nocolyse Neutral is a product based on hydrogen peroxide (6%), ready for use and produced to be used exclusively with the appliances Nocospray and Nocomax. The combination of Nocolyse Neutral with Nocospray (or Nocomax) has validated efficacy on all types of microorganisms as a frequent use, preventative process. It is proven to be bactericidal, sporicidal, virucidal and fungicidal. Nocolyse is also available with a mild Mint Fragrance – Nocolyse Mint or with essential oils to remove odours – Nocolyse Nocodor. A Bio-disinfectant for air and surfaces offering reinforced disinfection treatments. 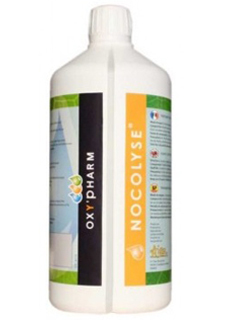 Nocolyse One Shot is a product based on hydrogen peroxide (12%), ready for use and produced to be used exclusively with the appliances Nocospray and Nocomax. 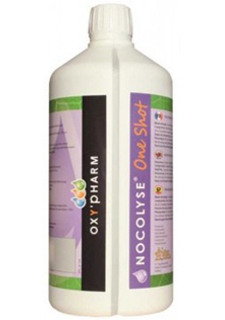 The combination of Nocolyse One Shot with Nocospray (or Nocomax) has validated efficacy on all types of microorganisms as an occasional use, Curative process. It is proven to be bactericidal, sporicidal, virucidal and fungicidal. A dual action Bio-disinfectant and Deodoriser for surfaces coming into contact with food. 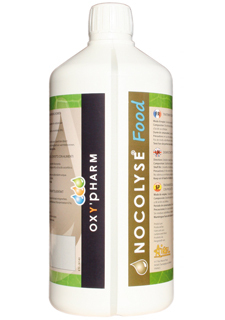 Nocolyse Food is a product based on hydrogen peroxide (8%), ready for use and produced to be used exclusively with the appliances Nocospray and Nocomax. The combination of Nocolyse Food with Nocospray (or Nocomax) has validated efficacy on all types of microorganisms as a frequent use, preventative OR curative* process. It is proven to be bactericidal, sporicidal, virucidal and fungicidal. (* dependent on concentration of treatment). A Bio-disinfectant for air and surfaces. Glosair 400 is a product based on hydrogen peroxide (6%), ready for use and produced to be used exclusively with the ASP Glosair 400 system. 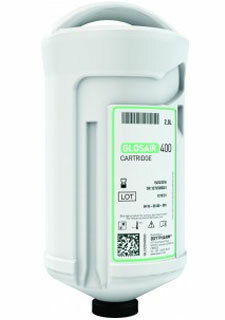 Innotec is solely responsible for the distribution of the Glosair 400 cartridges and carries no responsibility for the supply, maintenance or training of the Glosair 400 machines – all queries in this regard need to be made to ASP or your existing provider. Oxy’Pharm are due to launch a brand new Hi-tech Glosair decontamination machine during 2017. Keep an eye on our latest news section on the Homepage and on Twitter for information on this exciting new product and the launch date.